1. I have nothing to do with it. Oh sure, Stephanie and I are constantly invest and inviting, and our team works really hard to make our environments irresistible, but the Holy Spirit is the only one that can really motivate people to be in the room on Sundays. 2. That's not our goal. I know, that's weird for a pastor to say. But, filling the room, filling a bigger room, or building a big room and then filling it—this is not how we measure success! We measure success by one number: the percentage of adults who are active in small groups. Right now that number is 45%, and we feel pretty good about that, even though we're itching to see it go over 50%. The reason we care so much about that number is because of what happens in small groups. We think that's where "church" really happens. Last night our small group had such a great time. We met at Shane & Kelly's, and since we're still a pretty new group we took time out to have two members of our group share their life story. It's a great exercise in getting to know someone, and we all learned a ton about Anne and about Cliff. Fascinating stuff that helps you understand them better and love them more. Oh, and we ate great food and drank really good coffee and hung out having "grown-up" conversation while the babysitters back at home put everyone to bed. Very, very therapeutic! 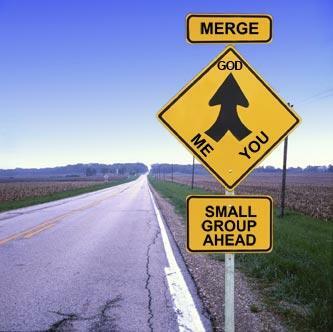 If you're not in a small group, one of your New Year's resolutions should be to join a small group this year. We're going to create a couple of new groups in February—that'd be a great time to jump in! Groups may be small, but they are our greatest success. Exciting! Keep up the great work Rich.